The above meme (click to embiggen) has been burning up my feed, and I think the sentiment behind it is spot on. The motivation behind the arrest of 14-year-old engineering whiz Ahmed Mohamed for bringing a homemade clock to his Irving, Texas high school was racism, no question. But I’ve been thinking about this for hours, and I think the above conversation misses the point entirely. 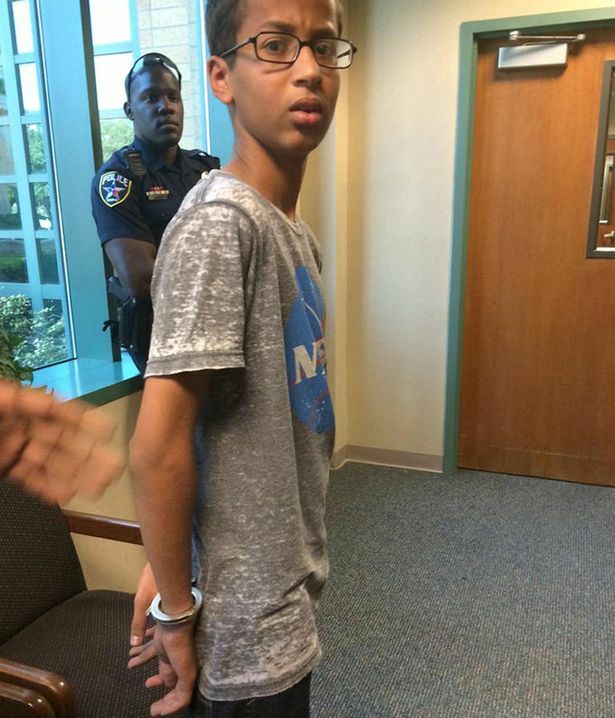 Ahmed Mohamed, 14, being led away in handcuffs in a NASA T-shirt. The look on his face breaks my heart. The police asked him repeatedly to explain why he had built the device, and to provide a “larger context.” When he couldn’t, they arrested him. The above picture of him went viral, along with the story, and the public outcry has, of course, caused Irving officials to begin to backpedal furiously, saying that he “wasn’t forthcoming” during questioning, never gave any more information than explaining that the device was a clock (probably because the device was a clock) and that they would have done the same for any student of any race. 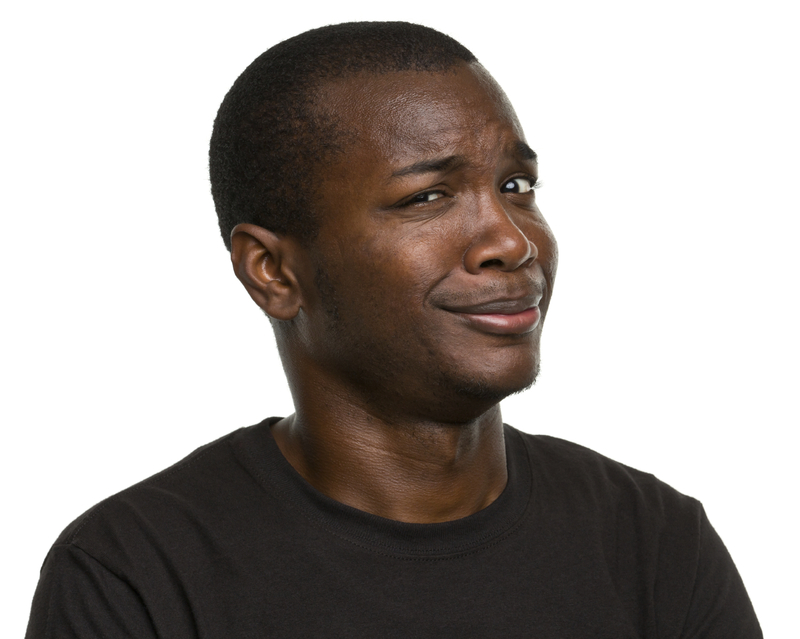 They created a narrative (“Muslim creates hoax bomb”) and framed it as his fault when he wouldn’t perform that narrative– they claimed he was uncooperative when he wouldn’t perform the role they had invented for him based solely on his ethnicity. Irving officials imagined Ahmed was a hoax bomber, and could therefore provide context– a reason he would build a hoax bomb and bring it to school. But he couldn’t provide context that didn’t exist. When he “refused” to give a “reason” he had created this “hoax bomb,” they grew MORE suspicious because they had already decided he was performing a narrative about Muslim terrorists. They literally could not understand the obvious context right in front of their faces– nerdy kid builds nerdy device– because they didn’t see him as “nerdy kid.” They saw him as “Muslim.” They could not put “nerdy kid who hangs out at Radio Shack and builds things” together with “Muslim.” Literally every single American went to high school with at least one awesome Radio Shack nerd. This is not some far-fetched, unusual, outlying teen identity. These kids are all over the country, and have been for decades. 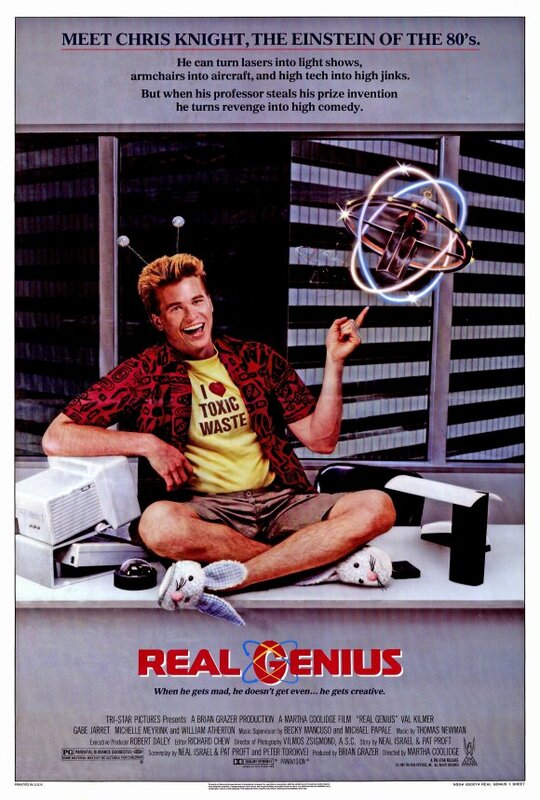 If Ahmed looked like Val Kilmer, this all would have gone down differently. The problem is more complex than just “they wanted to humiliate a Muslim.” That may very well be true, but we need to pay careful attention to the specifics here. America has created narratives for the millions of Muslims who live here, and we are unable and unwilling to understand when real people do not conform to those narratives, to understand that Muslims are people, as varied as any other group of people. We’ve created multiple narratives that see people of color as DANGEROUS, and we’re skeptical and mistrustful when people of color say they do not conform to those narratives. We imagine they’re just hiding something. People of color must prove again, and again, and again that they’re not something we invented about them. We’ve created a narrative that Latinos are illegal, drug-pushing rapists who are here to take our jobs. We’ve created a narrative that Black people, especially Black men (and boys) are essentially weapons lying in wait to attack innocent white people. And we’ve created a narrative that Muslims are all America-hating, bomb-wielding terrorists. And we BELIEVE in these narratives, despite demonstrable evidence to the contrary, despite the fact that anyone with four working neural synapses and 90 free seconds can sort out that those narratives cannot possibly be true. We BELIEVE in these narratives, and this is the result. Brilliant kids are arrested for nerding while Muslim. Sikhs are murdered, sometimes mistaken for Muslims. Muslims are murdered. A Muslim man was murdered in March just 12 miles away from Irving TX, part of a pattern of death threats and hatred inflicted on the local Muslim population. Let that sink in. Ahmed Mohamed lives in an area with an established pattern of anti-Muslim sentiment. If they had thought he had a real bomb, police would have killed him. Black people are gunned down in the street because an armed white police officer “felt threatened.” Latinos are beaten and leading presidential candidates say about the attackers: “They love this country and they want this country to be great again. They are passionate.” These narratives we’ve created for people of color are deadly, and we can’t just step away and dismiss them as someone else’s racism. It is of crucial importance that we understand that Ahmed’s arrest is one example of specific, carefully created narratives playing out everywhere, all the time. They accused Ahmed of building a hoax bomb because that’s what the narrative says Muslims do. When you blame unfocused, random Southern conservative bigotry for an evil act like this, you are effectively washing your hands of it, stepping away, and saying, “That’s not me,” instead of productively working to deconstruct the racist narratives in which we all participate to some degree. We’ve created narratives for people of color that cast them as “danger to America” and we must actively work to dismantle them, because people are dying, children are abused, evil is being committed in our names. I sure as hell am looking hard at what I’ve done over the years and wondering where, and how often, I may have contributed to this. You want to “make America great”? Work to dismantle these narratives and understand that most of what people talk about as “American exceptionalism” comes from the strength of diversity– bringing different people together to generate ideas and innovations they would not have otherwise come to alone. You want to “make America great”? Stop arresting nerds, stop killing people of color, stop pretending that America lost something when it became clear our white majority was quickly evaporating. Diversity is our strength. A NOTE ABOUT COMMENTS (9/21/15): This is my blog, not a news site. This blog reflects my personal opinion and analysis. I approve all respectful and worthwhile comments whether they agree with my opinion or not. I do not approve comments that use disrespectful language, that mock, belittle, or attack, or that otherwise engage in trolling. As this is my personal blog, I am the sole arbiter of how those terms are defined. If you wish to engage in respectful dialogue about the issues being discussed, whether you agree or disagree with my opinion or analysis, I invite you to leave a comment, and I will approve it as soon as possible. From the heart of a brown mama of a brown boy who is also the wife of a brown man, thank you. Thank you, Melissa, I totally missed that side of the story. Do you have any proof of that? If that’s the case, I will gladly change the image to one properly cited. I’ve seen the same status under several different names– I just grabbed the first one I saw in my feed for the purposes of the article. See his original post dated Sept 17, as well as a reference to Andy Iles on the 19th. I’m glad I took the time to read this. At present, I can’t think of any of my friends who happen to be of colour who AREN’T geeks. I hadn’t realized (though I should have) that folks at the intersection of colour and geek are vulnerable to stigmas attached to both identities. I wonder if there are any groups promoting inventors and scientists of colour? Wow. The kid brings a fake bomb to school and what should the teachers and police do? What is the proper, narrative dispelling thing to do? Apparently the teachers and police should have given him a pat on the back and said, “Nice try Ahmed. Your fake bomb didn’t fool us this time. You’ll have to try harder to make a convincing fake bomb so when we find it we evacuate the building and bring in a bomb squad. That way everyone will be fearful that the school is a target of a terrorist or a lunatic bomber who wants people to feel threatened. Now get to class, you silly boy!” I think it’s pretty clear that the narrative involved here is that white people are racists. But that’s legitimate, right? No need to dispelll that one. It was a CLOCK. It was not a “fake bomb.” Even if you want to say, “I would rather they erred on the side of caution”–which I completely agree with you on–they had the kid saying “It’s a clock,” the engineering teacher saying “It’s a clock,” and they had four police officers present to determine it was, in fact, a clock. And then they STILL arrested him AND suspended him from school. For what? Clock making? The point is that if they had any reason at all to believe it was a bomb, then they would have followed far different protocols, unless they are completely inept at their obs to the point that they should be removed from their positions for the safety of the people they are supposed to protect. 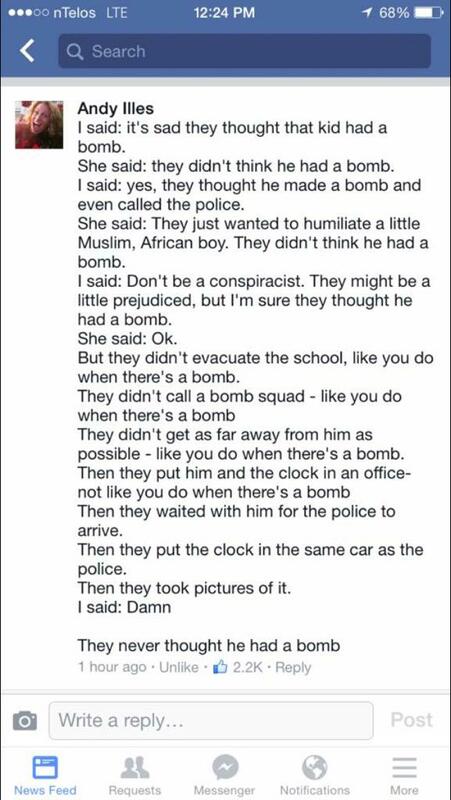 And they had zero grounds to suspect it was a “hoax bomb.” Yet they still arrested him and suspended him from school. For a CLOCK. But, of course, you’re doing a spectacular example of illustrating the author’s point. No part of you could understand the concept of a teen–likely of any color–doing an outside-of-school project and wanting to have their teacher see it. Sure, maybe it’s not because of his race or religion, but it’s not any better if it’s because of his age either, because the “all teens are lazy and just waiting to snap in a moment of complete violence” is yet another false narrative that we keep telling ourselves so we can justify when a school expels a student for making a “finger gun” or suspends a five-year-old for yelling “boom” during playtime. Kudos to you for being a real-world example of the entire thesis of the article. Personally, I hate Flemish people. Each and every one of them. Don’t get me wrong, this isn’t a case of me recognizing a general pattern about Flemish people at a population scale (humans are so good at pattern recognition! ), and then projecting that pattern onto all the individuals of Flemish ethnicity. That would be stereotyping. And you’re right, stereotyping – projecting conclusions about a general pattern onto individuals – is a worthwhile heuristic sometimes in that the benefits can more often outweigh the costs. But let’s not forget about the costs, and how much benefit does it really bring us? I think that’s worth considering a little more carefully. If you’re thoughtful, the benefits are lower because you have better tools at your disposal for sorting danger from safety. It would do all of us a lot of good if more of us would focus on bringing these elements to the front of our consciousness in order to gain better tools for this purpose. Meanwhile, the costs are externalized onto other people and to society at large, so you may not notice how big they are. No, I’m not stereotyping Flemish people. I hate each and every one of them individually. I’ve met all of them, you see, and I haven’t found a single Flemish person worth liking. What is more, every Flemish man and woman have slept with my wife, and I’ve had quite a lot of dogs, and all of the Flemish people have killed at least one of my dogs. I know it sounds absurd, but you would be surprised at what bastards Flemish people are. Individually of course. The point here is that no one moved “beyond the narrative” when it didn’t apply. 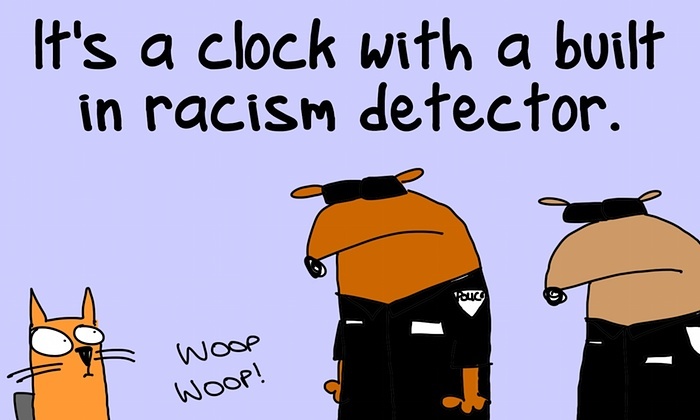 The kid said it was clock, the police ascertained it was a clock, and yet, even after verifying it was a clock, they STILL arrested him AND suspended him from school. For building a clock. At 14 years old, sure, you might think putting together a clock “from a kit” will impress your teacher. As a former geek teen, I could list plenty of things that I did–writing awful poetry that was very obviously “modeled after” better poetry, reading books that I thought were “advanced,” writing essays that were twice the length of the assignment–that I hoped would impress my teachers that, looking back, were not the least bit impressive at all. But I was a kid, and that was the scope of my experience. It was new and different for me. And it was also, at the very least, an effort to better myself for the sake of education. So yes, one mistake and there is tragedy, and I am on board with what the school did as far as the teacher reporting the “possible bomb” and the police coming. But the way it was handled demonstrates from the outset they never thought it was actually a bomb–you don’t keep everyone in the building with the bomb and the bomber for a casual questioning when he could just set it off. And when they had 100% surety that it was a clock, they still arrested him and also suspended him from school, for essentially doing extra course-related work and trying to impress his teacher. Great precedent to establish there–striving to achieve something educationally gets you arrested and booted out of school for three days. I now understand so much more about Texas if that’s how they run their educational system. Last weekend, on the public radio show “Wait, Wait, Don’t Tell Me” the host pointed out that not providing context is a standard communication trait in dealing with 14-year old males. This is an interesting take on the case, and I can’t help but see a pattern in my own thinking as a result, as someone who shared the referenced meme. I have trouble intuitively imagining a person being so absorbed in the narrative of “Muslim bomber” that not only does the narrative of “Teen nerd” not occur to them, but they punish a teenager for not conforming to the narrative, even though I consciously am aware of the power of such narratives over human psychology and institutions. But the narrative of “racist institution framing innocent” jumps to mind a lot more clearly once I notice a pattern of events that do not conform to “they mistakenly took it for a bomb.” And that narrative lead me to “calling it a ‘hoax bomb'”+”the kid never called it a bomb” sounding like “they are trying to hide that they were framing him.” But taking this perspective more cleanly fits with their inside-view and with human psychology than making them into “evil racists picking on children” even if they actually ARE evil racists picking on children. as a very naive person, i could not for my life figure out their questioning beyond the “it’s a clock”. what was the kid supposed to say………..?